Pope Francis urged political leaders on Monday to allow the rights of illegal immigrants to override concerns of national security. The Catholic leader says he believes the safety of immigrants travelling across borders should take precedence over national security concerns and that they should not be subjected to collective deportations. Reuters reports: His challenge to politicians, made in a comprehensive position paper on migrants and refugees, again appeared to put him at odds with the restrictive policies of a number of governments dealing with growing popular anti-immigrant sentiment. “Solidarity must be concretely expressed at every stage of the migratory experience – from departure through journey to arrival and return,” he said in a message ahead of the Roman Catholic Church’s World Day of Migrants and Refugees. 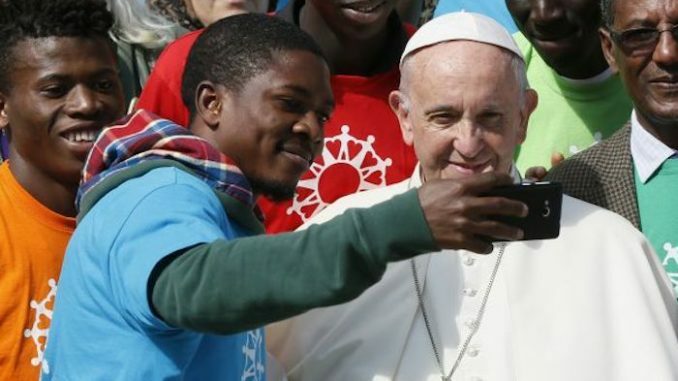 Francis said migrants should be seen as “a true resource for the communities that welcome them” and be given freedom of movement, access to means of communication, access to justice and everyday rights such as opening a bank account. Francis, an Argentine who has made defense of migrants a major plank of his papacy, has criticized anti-immigrant stands by national leaders including U.S. President Donald Trump. Last year, Francis condemned then-candidate Trump’s intention to build a wall on the border with Mexico. Migrant children deserved particular protection, the pope said. They “must be spared any form of detention related to migratory status,” guaranteed access to primary and secondary education and have the right to remain when they come of age. World leaders are due to commit their countries to two global compacts, one on refugees and the other on migrants, by the end of 2018 under the auspices of the United Nations.